OK folks, the debates around PE & ACS investigation over the last few years have been fantastic. Not only have they challenged our reliance on protocols, the debates have also asked us to question what we truly understand about the importance of diagnostic tests. Who to investigate and whether what we find matters has occupied many #FOAMites including all of us here at St.Emlyn’s. What we have sought is a sensible way of blending our pretest probability estimates of disease (using for PE tools like Wells scores, Geneva scores and/or PERC rules) to guide appropriate investigation and thus management. We have been concerned about the reliance of diagnostic tests, scoring systems, the harms of radiation and the success of anticoagulation. Arguably ever aspect of the process has come under scrutiny and that’s great. Well. This week we see the latest paper from Kline and his group with an RCT on the use of a quantitative web based tool to provide real time estimates of pre test probability. They have matched those real time estimates to appropriate diagnostic strategies to rule out PE and ACS. The comparison group did not get the webtool advice and thus ‘normal’ care took place. The aim was to guide clinicians to a post test probability of ACS/PE of less than 1%. Here’s the abstract, but as ever you really should read the full paper if you can get access. You can get access to the webtools free of charge and I’ve had a play around with them. I think it’s an excellent interface. It gives a pre-test probability, and also the confidence intervals of the precision of that estimate. You can also input in your test results and get a post test probability in real time. For someone like me who has geek tendencies this data is marvellous and I can really see this helping in my understanding and explanations of risk with colleagues and patients. It appears that the data behind the PE calculator comes from this study, also from Kline’s group. The ACS data comes from this study, again from the Kline group. These seem to work OK, but just playing around tonight with the ACS tool revealed that it lacked sufficient data to make risk calculations for many combinations. That’s good that it’s not guessing, but also a little disappointing that we still don’t know. The trial itself is quite complex and requires a glass of something nice and a good hour to get through, and to be honest I’m still getting my head around it. I need a little more time to work through the full critical appraisal, but I think this is so topical that we need to get this out for others to share and discuss as soon as possible. 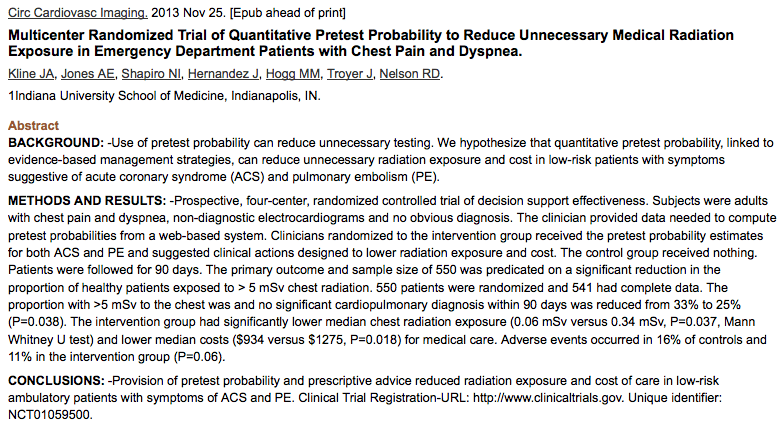 The principle results, that a quantitative pretest probability estimate reduces the radiation dose to patients is probably a good thing, although I would welcome views on the non-significant trend to fewer diagnoses in the intervention group (is that because they were missing them I wonder?). I am also pondering whether the radiation savings and cost savings in this trial are transferable to Virchester as the results (table 2) suggests that they might be more investigationally aggressive than we are here at St.Emlyn’s. Do I think this is a gamechanger? Potentially in that this use of an online, real time pretest probability calculator to guide investigation could be applied to many other aspects of emergency care. This sort of decision support software has been tried many times in the past and never really caught on, but in the investigation of PE/ACS we have struggled and perhaps it is an area where we might see some benefits. I’m really interested to hear what others think about this. Very interesting Simon. I think it has great potential in training our brains to more realistic pretest probability guesstimating. We know gestalt is pretty good in PE, maybe a more refined version will compete – Kasparov vs. deep blue? I have a post brewing on this philosophical point …. yep most interesting. I do wonder whether removing gestalt entirely is a good thing. Part of gestalt involves the veracity of one’s belief in an alternative diagnosis and I think this is important to retain. If you have a patient who has all the hallmarks of pneumonia I’d be cautious about outsourcing my probability estimates to a calculator that can’t take that into account. I wonder if that is why the actual reduction in radiation due to the intervention was relatively small – that is, even though, in general, clinicians overestimated PTP compared to the calculator, in some patients they had their PTP overestimated by the calculator due to failing to take into account gestalt. Perhaps more interesting was the reduction in adverse events in the intervention group 11% v 16% that was almost significant (p=0.06). would be more gradual than this dichotomous cut off result suggests. In any case while the calculator might be one tool to estimate PTP, the key part is what you do with that PTP i.e what you believe the test threshold is.